Every competitor has done it, clicked on their arch rival’s online advertisements knowing that they just took a small chip out of their marketing budget. More savy business people find better ways to spend their time, however, what if this practice was scaled? Imagine a whole team of people who spent their days purposely clicking on ads, or even worse an automatic program which mimics a real user, working 24 hours a day, 7 days a week. Make no mistake, this happens every single day and there are even providers who offer this service. In fact it can be a huge problem for online marketers who rely heavily on paid ads in their campaign mix. From personal experience, we find this problem to be rampant in highly competitive industries, especially in the trades and small business sector. First you need to identify if the problem exists and there are a few quite easy ways so do this, but it depends on the depth of your knowledge. With that said, here are a few symptoms to look out for. 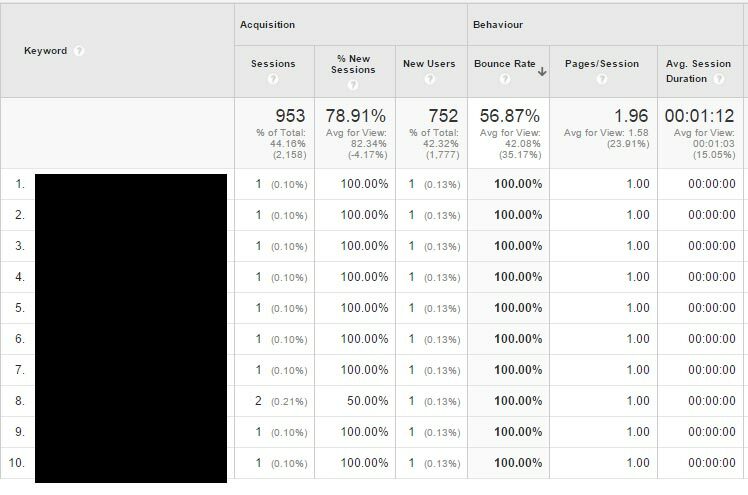 Does the screenshot from Google Analytics look familar below? This is really dependent on quite a few factors but if you have a decent website with a compelling offer you would be doing well to get a conversion rate above 15%. On a good day in a competitive industry we’ve seen conversion rates of 60-70%. If you are noticing a high click through rate (CTR) and a relatively low bid position (3-6) you should also be suspicious. This really depends on your ad copy and how high or low the involvement is in the consumer decision making process. If you have generic ad copy, selling a low involvement product and your CTR is ‘just killing it’, maybe think again. Does your budget run out within the first hour or two of the day? Mix up the start time and see what effect that has on the campaign’s effectiveness. This of course depends on how many daily impressions your key phrases are exposed to, but if your budget is exhausted in the first hour and you didn’t get any enquiries/sales, investigate further. Ever seen this in Analytics for your paid channels? Quite simply, if you’re targeting highly relevant phrases, to highly targeted audiences and sending them to highly relevant pages on your website, you shouldn’t expect to see high bounce rates and 0 sec time on site. Use the behaviour flow section of Google Analytics to diagnose repetitive, suspicious user behaviour flows. You can take it one step further by placing buttons, implementing CDN’s or forcing manual compulsory actions like Capcha to help identify and weed out robotic-like behaviour. So now you should have a pretty good idea of how much click fraud you’ve been receiving so let’s move onto prevention. There’s no silver bullet here unfortunately. First you are relying on the integrity of the Advertising platform you are using and in our experience none of them are perfect. Most third party systems do the heavy lifting for you. They have their own algorithms which they use to quickly identify and prevent click fraud. Most of them work by blocking IP’s/IP ranges after a suspicious pattern of behaviour has been identified. Usually they become more effective the longer you use them. We’ve used a couple and instantly doubled our clients’ conversion rates, but they do come with monthly costs. Find out what IP’s all your main competitors and their respective digital agencies use. Block them all by adding them to the IP address blocking feature. Any good digital marketer would know that there’s always ‘juicy’ sections of the market that can be less competitive and far more effective. If you’re using Adwords try shifting away from the main key phrases and experiment with longer tail, more qualified phrases. You’d be surprised how little they can cost and how much more effective they can convert. If you’re using Display or Facebook, try being more specific in the way you target. Before you spend your time and resources doing all of this, you’d want to be spending a significant amount of cash on these platforms (hundreds to thousands per day). However, if you put some successful click fraud prevention strategies in place, the results can be amazing giving you and your client a win-win situation.